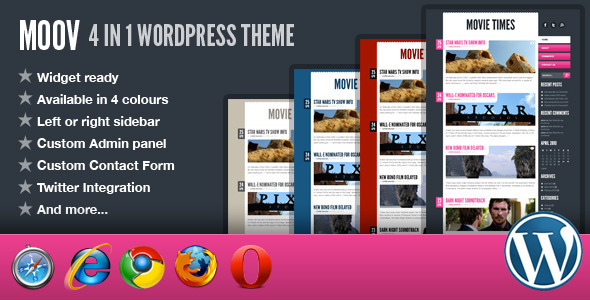 Moov is a wordpress theme available in 4 colours; light, dark, blue and red. Moov is widget ready and has its own custom admin panel so you don’t have to touch any code to customise it. Updated Cufon font to allow for extended latin characters such as: é, è, à, º, ã and lots more. The images included in the Moov files for display purposes only are listed below. All of these files are licensed under Creative Commons.